There are several ways to start Metal Geometry, a tool in the Structure Analysis category. 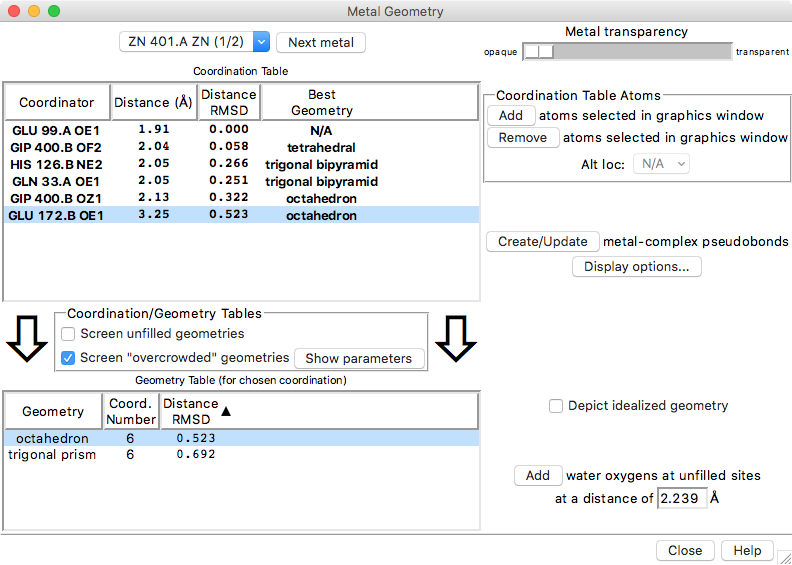 Metal Geometry can also be started by by double-picking a metal ion from the graphics window (doubleclicking it with the button assigned to picking) and choosing Coordination Geometry from the resulting context menu. When multiple metal ions are present, the site of interest can be chosen from the pulldown menu near the top of the dialog. Clicking the Next metal button chooses the next metal ion in the list. The view in the graphics window will focus on the specified metal ion and nearby atoms. The Metal transparency slider allows adjusting the transparency of the displayed metal ion. 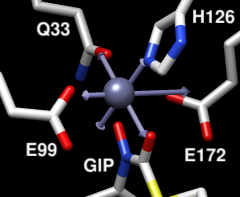 Clicking Create/Update will generate or delete coordination pseudobonds to the metal as needed to represent the current ligation set. Clicking Display options... brings up a list of pseudobond attributes for this group, allowing changes in properties such as color, linewidth, and whether the lines are dashed. When an individual pseudobond is selected, its attributes can be altered with the Selection Inspector. Clicking a row in the Geometry Table chooses that metal coordination geometry. Depict idealized geometry shows the chosen geometry with arrow objects, and water oxygens can be Added to occupy any unfilled sites. The distance from the metal at which to add water oxygens is automatically set to the average for the current ligation set, but can be edited. A geometry is considered overcrowded if hypothetical metal-ligating atoms placed at the ideal angles for that geometry, at a distance equal to the [average | maximum | minimum ] of the actual chosen ligating atoms, would be less than mindist (default 2.8) Å apart. Clicking Hide parameters hides the overcrowding settings. Close closes the Metal Geometry dialog. Help opens this manual page in a browser window. In an idealized coordination geometry, the ligating atoms fall along vectors that emanate from the metal ion. The angles between the vectors are characteristic of the specific Geometry. The radiating set of vectors is repositioned to coincide as much as possible with the real positions of the metal ion and ligating atoms, and then for each real ligating atom, an idealized ligating atom is placed along the corresponding vector at the same distance from the idealized metal ion as the real atom is from the real metal ion. The best-fit root-mean-square deviation between the real atoms (including the metal ion) and their idealized positions is computed.